Trust Waikato Sunset Beach Lifeguard's had 2 x U19 Men's Surf Boat crews competing at the North Island Surf Boat Champs held at Waihi Beach 5th and 6th February. The Sunset Young Guns won the Gold Medal and are now the U19 North Island Champs. This was also part of the NZ Surf Boat Series so the win assured them of Gold Medal for the NZ Surf Boat Series. With Piha Big Wave to go in two weeks time on the 18th February, the Sunset Hipsters have to wait and compete to retain 2nd position in the series. Day two was the NZ Regional Surf Boat Challenge. 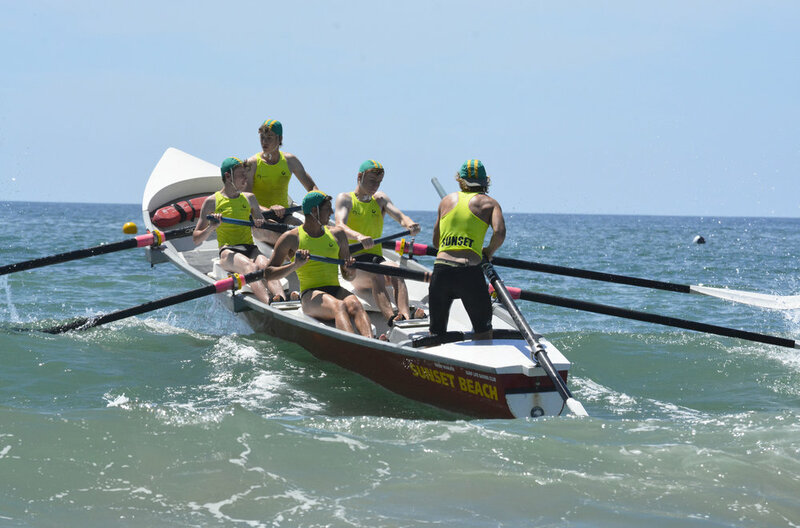 Four regions competed for the trophy with Sunset Young Guns representing Northern Region U19 mens and Sunset Hipsters rowing for the Central Region. Northern Region retained their title winning gold and the trophy. Central Region were 4th. Champion of Champions was then held with 24 teams competing for a position in the A, B and C grade final. Sunset Young Guns and Sunset Hipsters made the A grade final. The Sunset Young Guns with some awesome rowing came 2nd overall and Sunset Hipsters 5th. This was competing against senior teams. Ted Marsh was proud of the performance of the teams. "Good performance all round by the Sunset Young Guns and Sunset Hipsters. Sunset Young Guns holding onto their NZ Title in the NZ Surf boat series and Hipsters in second place till Piha Big wave is testament to how these guys are rowing". "They represented their Regions well and have a huge respect amongst the senior teams as up and coming rowers. Sunset Beach can be proud of these young men!"